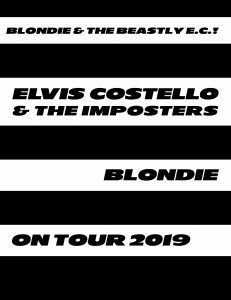 UNCASVILLE, CT (April 2, 2019) – Elvis Costello & The Imposters and Blondie will co-headline a coast-to-coast tour this summer. The 13-city tour will make a stop at Mohegan Sun Arena on Sunday, July 21st at 7:00pm. Tickets are $75.00, $55.00 and $35.00 and go on sale Saturday, April 6th at 10:00am through Ticketmaster. Ticketmaster customers may log on to Ticketmaster.com or call Ticketmaster’s national toll free Charge By Phone number 1.800.745.3000. Tickets will also be available at the Mohegan Sun Box Office beginning on Sunday, April 7th at 10:00am, subject to availability. Elvis Costello & The Imposters’ widely renowned Look Now was released in 2018 and of which Variety said, “It’s so funny to be seeing him, after all this time, making a great cake of an album that doesn’t really sound that much like any of the 30 before it.” The catalogue will soon include the E.P., Purse, containing songwriting collaborations with Burt Bacharach and Paul McCartney and musical settings of lyrics by Johnny Cash and Bob Dylan. Since the release of their self-titled debut album in 1976, Blondie has brought the worlds of Rock, Punk, Disco and Ska together and racked up four indelible Billboard Hot 100 #1 hits – “Heart of Glass,” “Call Me,” “The Tide Is High” and “Rapture ” – as well as six #1s on the UK Singles Chart including “Maria,” “Sunday Girl” and “Atomic.” Debbie Harry – genre-spanning visionary, complex songstress, incandescent front woman and style icon – and the band’s boundary-pushing Pop have shaped the look and sound of many chart-topping female artists who have followed and have made Blondie widely recognized as one of the most influential bands of our time.